Great ideas are often the most simple, combining a number of things, keeping the price point correct and identifying a desire or need within the marketplace. As I have said, surfing is cool at the moment, for me it always has been cool but it is now a trending sport for the masses. A good portion of the masses like things to look nice, it's not a surfer or non surfer thing, it just boils down to the type of person you are. Are you someone who appreciates how things look aesthetically? Or are you more of a 'slap it all together', 'function only' type of person? It takes all sorts to make the world go around. Vini Patch is simple, effective, clean and looks pretty cool. Use some solar res or sun-cure which is messy, a pain to get right and if you don't sand it properly you have sharp edges which can be lethal for cuts. Everyone has their own way of doing things and guess what, it's usually the best way. When I saw Vini Patch I thought that it looked like an awesome idea. It's not ground breaking, its not some new technology that will blow you away but it does identify a need with certain types of surfers. People who like things to be in containers, don't like mess and appreciate the way things look. Who'd have thunk it, turns out I am one of them. The Vini Patch applied, almost enhances the way your board looks. If you are looking for a repair kit that is not messy, has everything you need in it, comes in a cool little tin and makes you board look almost enhanced, then this is it. The guys at Vini Patch have also got something else right. The price. Under five euros for five small patches means it's under a euro a repair, and it's instant. You can apply (once the board is dry) and go back and surf, it fits in you pocket and is roughly the size of a small book of stamps (not sure if people still buy books of stamps). The whole lot fits nice and neat in the tin. No mess, no fuss. It's like a surfboard SOS kit that will fit in the glove box of your car, in your carry on luggage or anywhere you might usually fit a tin of sardines (about the same size). You will find everything in the tin that you will need to apply the patch. Cool huh? A while ago we thought we would get in touch with the guys at Vini Patch and see if they were interested in letting us test a couple of patches out. They said yewww and we were like yewww so I got my patches and the kit you see above. The only problem was I had a full quiver of hole free and fully functional water craft, nothing to test it on. I made a few calls and spoke to a fellow surfer who was blessed with an articulate way with words similar or better than my own. He had a dinged board that he had not yet taken to get repaired, I asked him if he wanted to try a Vini Patch and he obliged with an affirmative answer. The big kit and the small. One for your glovebox, the other for your pocket. As is the way with surfers, most of the time when you meet is for a surf so we scheduled a session in the near future to meet up and I would give him some patches to test out. The day came and the conditions looked small but fun at our local beachie. Being old but both still frothers, we decided to get the surf out of the way before discussing other things. I selected a favourite board of mine for small waves, one I had bought second hand with some defects but turned out to magic, this board for some reason (sanded back too much on the rails maybe) is prone to ding on the rails if a breath of wind catches it wrong. To cut a long story short I managed to put a big crack in the rail during the surf (must have exhaled too close to it) and now I had a ding that needed repairing too. Hooray, I think. The multi card. One side to scrape the wax off, the other to smooth the air bubbles out. Simple but effective. I gave my articulate friend a couple of patches to try out and report back on and I headed home to get my board dry and ready to apply my first Vini Patch. It's curious that way the world works sometimes but now the test had begun. It turns out that the ding I had put in the most fragile railed board in the world was quite a big crack and I had to select the biggest patch. I used the supplied credit card size scraper to remove the wax and then one side of the red Vini Patch embossed cloth (supplied) to get and small smears off. I had a nice clean surface on which to apply the patch. The application was easier than putting my pants on in the morning, just take the sticky back off and stick. Use the other side of the credit card thingy to iron out any bubbles and polish with the other side of the red cloth. Done. Ready to surf. The whole process took 3-4 mins. What you get in the tin for under thirteen bucks. It's all you need for small dings. As for after testing, I have used the board 4-5 times since and the patch is still on there in the same condition as when I applied it. In fact I managed to ding the rail again (no idea how) and after applying another smaller patch I was able to surf with no leaks or signs that either patch was coming loose. All good. While we have your attention we thought we would ask Martin and Viktor from Vini Patch a few questions that are just better to get from the horse's mouth. SB: Hey guys, thanks for the patches and sparing us the time, how did the idea and concept of Vini Patch first come about? Viktor: One day you wake up with a new mindset that changes the perspective about a particular object. We were working in a project searching for applications for a new material (similar to what we currently use in our patches, only thicker and with a different adhesive). We weren't able to advance until this change of perspective happened while we were sitting in the couch with a surfboard in our living room which had some repairing to do. We immediately decided to try it on the surfboard and the Mundaka wave was the perfect spot to do so. It had a lot of potential, but we weren't convinced at the beginning. We thought it could do more. Eventually, adjusting some of its properties with our supplier we ended up with what is now called Vini Patch. SB: Do you have any tips to applying the patches? Martin: It is so easy you don't need many tips really. You always have to clean and dry the area where you will apply the patch. After that, make sure it has a clean and smooth finish, with no air bubbles left inside. There is though an extra trick: when needed, specially for areas like tails and noses, if you apply heat to the patch, with a lighter let's say, it will adapt perfectly to any kind of shape and it will become more elastic. We are currently developing a new website where it will be explained through video tutorials. SB: The designs on the top of the patches kind of enhance my board which is cool. Are you thinking about bringing out any new colours or designs? Viktor: Absolutely, we are eager to create new patterns and images to have a wild range of designs, to keep providing new collections and limited editions. Our aim in the long term is to collaborate with different artists and implant their drawings and designs to our patches. We are trying to build a community and be able to give opportunities to local artists as well as sharing any possible profits. This way we can add design value to our brand and products beyond functionality. It really is super easy to apply and can be done in situations like this. Straight back in the water, worry free. SB: What is next for Vini Patch? Do you have any products that you are working on? Viktor: This is something that our minds can't stop thinking about. We would love to carry out all the ideas that come to mind, but they're not always viable. We are working on new products that fit with the brand dynamics, trying to solve day to day surfing problems in the simplest of ways. Right now we are obsessed with a patch for wetsuits, without the need for sewing, glues or ironing... Who knows, maybe we'll be answering more of your questions in the future if everything goes right! The small kit is perfect for lightweight travel, fits in you wallet. It's under five euros. SB: Do you guys sell Vini Patch in any surf shops and do you post worldwide from your website? Martin: We do both. Our main goal in the long term is to have our Vini Patch in all the surf shops worldwide. Of course this is hard work, but we are committed to do so. We also post worldwide from our website, unfortunately shipping costs are nowadays high in proportion to the price of the product. Certainly something we'll try to improve. 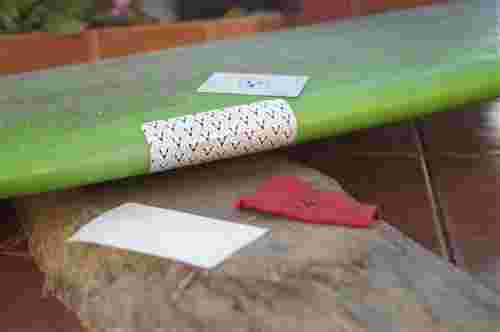 After all, the idea is that any surfer that finds himself in need of the patches should be able to purchase it at an affordable price, either through his or her local surf shop or buying it online. Dinged board. Have to get out. Waves still pumping and missing out? Check out Vini Patch. SB: With so many cool things to look forward to from new designs by artists to a possible patch for wetsuits, the guys at Vini Patch are more than deserving of a close eye being kept upon them. One can't help thinking there are pretty cool things just around the corner, with their attention to detail, realization of a good price point and finger on the pulse of what makes life easier for a surfer, there can only be a bright future. Right, off to do some Christmas shopping now and guess what I am going to get everyone I know that surfs, that's right, it's some postage sized packs of the Vini wonder Patch. Not only are they super cool, very handy and cheap to post but also easy on the wallet #cheapskatejim. The finished product, super water tight and has lasted longer than I expected so far. I will keep you updated. When I got back and cleaned up the ding it was bigger than I thought. I had to use the biggest patch.